USciences Department of Humanities hosted Pilar Ortega, MD, an emergency physician and clinical assistant instructor at University of Illinois at Chicago on November 29, 2018, for the annual Bernard J. Malis Memorial Lectureship in Humanities. Dr. Ortega, a bilingual physician who has helped to lead the National Medical Spanish Taskforce, spoke about the importance of language to healthcare, specifically maintaining patient safety and minimizing medical errors. “We are trying to impact health equity and health outcomes for all, regardless of the language they speak,” said Dr. Ortega. Increasingly, scholars and clinicians recognize improved communication in medical care—physicians and patients speaking the same language—as an important factor in patient and provider satisfaction, quality of care, decreased medical error, and improved patient outcomes. Although the U.S. is among the top five nations with Spanish speakers, we have neither standardized or incentivized physician second language acquisition. 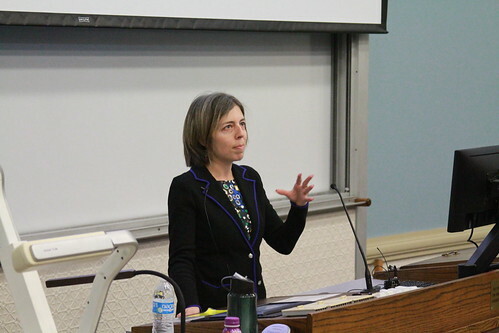 Healthcare providers need to understand the importance of language, the need for professional, medical interpreters, and the cultural factors that also exist when providing information or recommendations to a patient, Dr. Ortega said to the room filled with students, faculty, and staff. Dr. Ortega’s National Medical Spanish Taskforce is seeking to standardize medical Spanish learning and education in medical schools across the U.S. and hopefully pave the way for competency training in other languages as well. “Language is a medical skillset and a tool, just like a stethoscope of anything else that we need in the medical process,” she said. The Bernard J. Malis Memorial Lectureship in Humanities was endowed by Bernard Malis, who graduated from PCPS in 1944 with a BS in pharmacy and in 1947 with an MS in pharmacy. He was a consultant in pharmacology and public health, and was chair of the Philadelphia chapter of the Explorers Club. In 1989, Malis was elected a fellow of Royal Society of Arts.